FAQs / What types of alert do I get on each user level i.e. Account Owner, Admin, or a staff user? Type of alerts that can be sent to each user level can be either ‘an email sent for each subscribed event’ or ‘a daily digest that summarizes all the events for the day’. Staff users receive email alerts for actions they’ve subscribed to only when they’re involved in the action. * Order Printouts will be sent with these alerts. Note that this is only applicable when the email template is set to ‘Default’. Customized Email Alerts for Users: An admin can also customize the email templates for most of the alert types from More -> Alerts -> Alert type e.g. Order Booked -> Click Add New. You can then customize the template for ‘Order Booked’ alerts. Insert placeholders containing dynamic data such as order number, completed by, duration, and more (Note: Customization does not apply for mail digests). 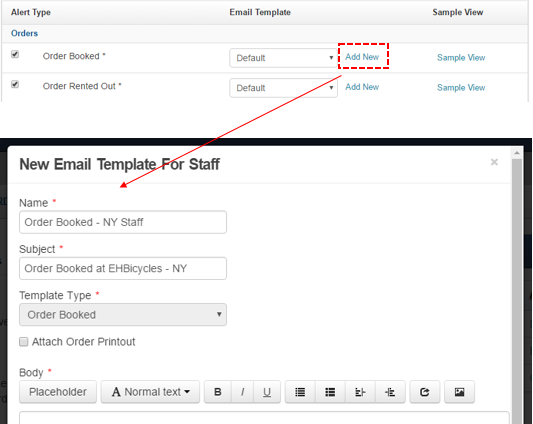 Learn More on customizing email templates. Admins can also view, edit, activate/deactivate or customize email templates from the Alerts page -> Click Email templates button on the right -> Choose User Templates -> Click ‘Add New Template’ button on the left. On the Alerts page, an admin and a staff user can also customize these alerts based on groups and locations (see image below). You can receive alerts specific to these groups and locations. Note: Admins and staff users can filter what kind of alerts they want to receive from their accounts. Also, users can subscribe to our regular newsletters. Only account owners can subscribe to performance reports.